Located in Petaluma California, Dr. Von Chan specializes in Pediatric Dentistry, Implant Dentistry, and Cosmetic Dentistry. Dr. 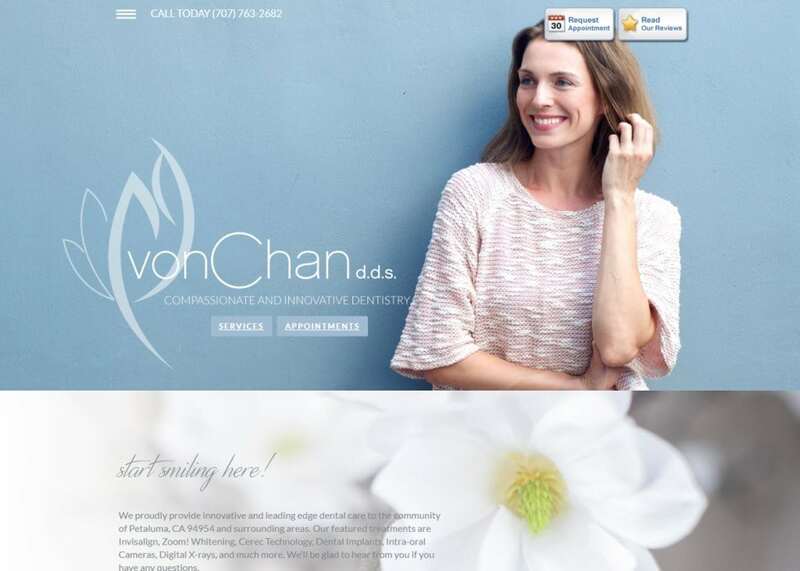 Von Chan also offers many additional dental products such as Invisalign, Zoom! Teeth Whitening, and 1-Day Cerec Crowns. When dealing with a certain niche or specialty, we always go out of our way to make sure to highlight these different options through our website design. When you can offer more than the next dentist, you can need to market yourself dental office to reflect that. For this website, we went with a full-width design layout, rather than the traditional website with marginal space. This allows us to space everything out accordingly. When you visit the home page, you are immediately drawn in by the personable images of Dr. Von Chan herself. The home page primarily serves as a summary of the different services and products offered about the practice. Scrolling further down, you have the option of taking a tour of the office along with reading real patient testimonials. We utilized a simple color theme of blue and white to add to the dental theme. In addition to the professional still shots provided by the office, the colors help add another layer of visuals. We primarily used white to highlight calls to action on the home page and navigation bar. blue serves as the main background color. When placed side by side, the colors add a memorable aesthetic to the site. When you are marketing for any website, you want to make sure that the colors you provide match the specialty. We never want the color palette to overshadow any of the actual content on the site. The colors we chose to complement the typography and the overall layout of the website. One standout feature on the website is the lack of a traditional navigation menu. In its place is a hamburger menu. This allows more interface space for the readers as well as opening up the top banner for additional calls to action. Instead of where a traditional navigation menu would be, is the ability to request an appointment and read the reviews that the dentistry has displayed. The site is designed to integrate volume with style. On most pages, there is a gliding effect that catches the reader’s attention. All the images on the website are professional and uplifting. When designing any website, formatting is particularly important. We ensured that we allowed open space for readers to steer and maneuver through. No one likes a cluttered page. We kept the formatting on the simple side – rich in informational volume, dense in quality. Dr. Von Chan offers a tour of her office on the hamburger menu. Not only is this a great way to convert new patients, but it is also a great way to help settle incoming patients who may have some level of dental anxiety. Since the dawn of time, visuals have been a great way to not only persuade but to inform and educate as well. Dr. Chan is no stranger to visuals as she provides educational patient videos on her hamburger menu. Having a niche specialty means having a more specified audience range. This also means that your products are tailored to certain issues. Dr. Chan knows that dental work is not necessarily cheap. To help patients counteract this issue, she has provided in-house membership and promotions/events on her website. Not only does this show compassion and understanding, but this can also help add a layer of personability and credibility to the dental office as well. Establishing the patient-doctor relationship early on is crucial to bringing in both new and returning patients.